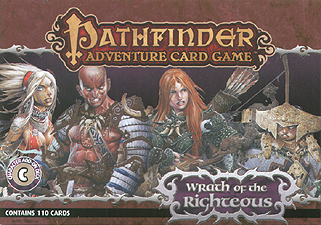 Take your Pathfinder Adventure Card Game Campaign to the next level with the Pathfinder Adventure Card Game: Wrath of the Righteous Character Add-On Deck. The 110-card expansion deck includes four new iconic Pathfinder Adventure Card Game characters - Adowyn the Hunter, Crowe the bloodrager, Seoni the sorcerer, and Shardra the shaman - along with all the additional cards you need to expand your adventure to accommodate 5 or 6 players. This deck is stocked with new weapons, spells, items, and allies, as well as additional copies of some of the game's most useful gear - everything you'll need to face even the deadliest challenges. Level up your adventurers with the Pathfinder Adventure Card Game: Wrath of the Righteous Character Add-On Deck!